Survey Design: ESE designed, implemented, and maintains on-line health surveys for the American Spaniel Club Foundation (ASC), The Leonberger Club of America, the PBGV Club of America (PBGV), and the Rhodesian Ridgeback Club of the United States (RRCUS). Please click here for several articles about the RRCUS survey. Web site Design: ESE designed and/or maintains the web sites for The Chamber Singers, the Gogebic Range Master Gardeners, Theatre North, the historic Ironwood Theatre, and the Luther L. Wright Class of 1959. See links on the left of this page. Statistical Analysis: When requested, ESE can do statistical analysis including measures of central tenancy, measures of dispersion, and ANOVA. ESE can either write up a report or submit the data analysis or raw data to your report/grant writer. Event Registrations: ESE designed an on-line registration package for the Leonberger National Specialty Show, It included ordering meals, ordering merchandise, registering dogs in events, arranging airport pickups, and registering to attend seminars. It included a registrant's profile which allowed a registrant to return and modify their selections until the cut-off date and print invoices. It also includes comprehensive on-line look-up functions for show organizers. Data Management: ESE designed and implemented on-line data collection and a storage system for surveys done by the Wisconsin Woman's Health Foundation. The system tracks seminars, clients, questionnaire answers, and more. Please look at the right column for breakdowns of current services and a partial client list. If you have something else in mind please contact me and I'll be happy to look at the feasibility and submit an estimate. Ese can design your web survey from your existing questionnaire or from scratch. I can set up a Microsoft Access® database to store the results on your site (if so equipped), or host the survey on my site using either Microsoft Access® or Microsoft SQLII®. I can provide you with the raw data, with statistical summaries, or with the raw data with all personal identifying information stripped out (depending on your confidentiality model). I am capable of providing many different output file formats. My web site design philosophy is to construct sites that are content dense, stable, download quickly, and use only those gadgets that contribute to content or ease of use. I use the latest standards in Internet design to ensure your site will continue to display correctly on newer versions of web browsers. 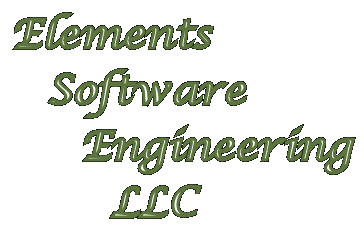 Elements Software Engineering (LLC) is a sole proprietorship Limited Liability Corporation owned and run by Larry Hopkins. I am a member of the Association for Computing Machinery (ACM) and the Mathematical Association of America (MAA) I have a B. S. from the U.S. Naval Academy (USNA) at Annapolis Maryland (1963), a M. S. in Mathematics from Michigan State University (1970) and a M. S. in Computer Science from Michigan Technological University (1991). I taught college level mathematics and computer science for 32 years and I subscribe to both the USNA Honor concept and the ACM's Code of ethics. If you are here checking on Kris's progress, please click on the "Kristin" link on the left.